I would like to share with you how I find out where and when contrails are likely to form. It is a good idea to for me to check for contrails because the contrail is an important part of our photography and makes the photo more unique IMHO. Foreword: This is quite a complex subject and I am by no means a scientist or in any way qualified so please correct me If you think something is incorrect. First of all it is worth mentioning that the forming of contrails is dependent on the weather conditions in our upper atmosphere. They generally form at temperatures at or below -45°C. It is also worth noting that contrails commonly form in high pressure weather, but can be found in low pressure systems at lower altitudes, especially in winter! First we can check for contrails using this weather model for today and for a few days ahead. 3. Take a look at the map and notice the colours and the guide on the right side. Generally Green/Blue/Purple = contrails, Red/Orange/Pink = No contrails! Also notice how the map has labels along the contours also showing the temperature. 4. You can also check temperatures for FL380 by selecting 200hpa Geopotential, Temperatur. As you can see the large green area shows where the contrails were forming at FL380 today. 5. Use the arrows below the map to see the forecast for the next few days ahead. The data found here is reliable enough for up to 5 days ahead in my experience. Weather balloons are used to collect information about our atmosphere including pressure, temperature, humidity, etc. We can also use this data to find out if contrails will form. Weather balloons are released at 00Z and 12Z every day and collect data in our atmosphere as they rise in height. The data is then sent back to the weather station below and published on the site below. 3. Find your nearest station. 4. You will be presented with a list of data. Look at the column TEMP (C) and scroll down until you find -45 or below. 5. Check in the same row the HEIGHT (m), this is the approx. altitude at which contrails should start. Below is an example of the sounding from my neareast weather station (Cambourne 03808) at 12Z. 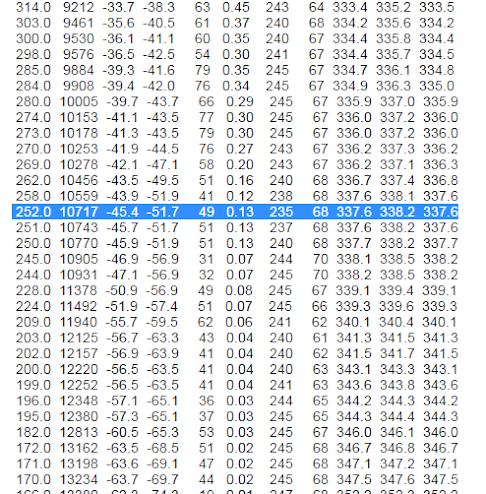 I have highlighted the row showing -45.4 in TEMP (C). The HEIGHT (m) shows 10717m or FL350. So contrails should form at that altitude. So there are my two ways to tell when/where contrails are likely to form and so far I have found them both to be reliable. If you have any questions or would like to add your own methods then please do. I totally agree with you. Thanks James, I am going to test it asap and I will let you know.